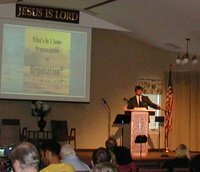 This past Sunday I had the privilege of teaching on Jehovah’s Witnesses at Concordia Lutheran Church in San Antonio Texas. If you would like to listen to this presentation, follow this link. If you would like to have a copy of the outline that we went through, e-mail me and I’ll send it to you in a Word document. Feel free to pass this along to any pastors you know who may be interested in having us speak in their Church. 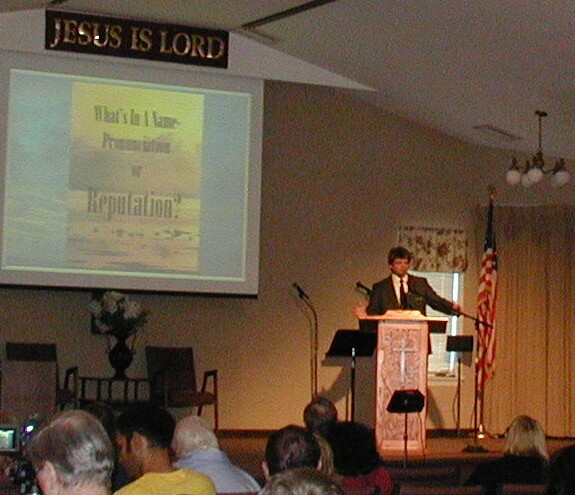 We love to equip congregations in areas that pastors just do not have time to delve into. I went with my folks today to pick up my brother from the airport. He is visiting for CHRISTmas. Since we got to the airport early, I decided to drop by and see if the Jehovah’s Witnesses were there. They have a booth in terminal one where they usually station themselves. Sure enough, they where they. My folks and I went into the Starbucks in the terminal and on the way, I took a Watchtower magazine from the two JW ladies. The title said something about living forever. If you know anything about my Dad, you will know that he is notoriously EARLY for everything. Since we had close to an hour, I decided to spend it with the JW’s. I went back to their booth and asked if they wouldn’t mind answering a question about the magazine I took from them earlier. The magazine talked about living forever so I inquired about where they expect to spend eternity. As most Witnesses will say, they expect to live forever on earth. I brought up the thief who died next to Jesus and asked what Jesus promised him. They were familiar with the account and correctly said that Jesus promised to be with Him in paradise. I pointed out that since Jesus said He was going to be with the thief, then regardless of whether the thief spends eternity in heaven or on the earth, he would be with Jesus. Since this is completely foreign to Watchtower theology, the JW ladies gave me blank stares. As most conversations with JW’s go, we talked about a number of different topics. We got to talking about the resurrection of Jesus Christ and they wanted to know why I believed that Jesus was raised in the same physical body in which He died. As the title mentions above, I was not quite prepared- I did not have my Bible with me. Interestingly enough, they did not have their Bibles either. I asked for a pen and paper and wrote down a couple of passages that prove that Jesus still has a physical body. First Timothy 2:5- For there is one God, and one mediator also between God and men, the man Christ Jesus. Notice that this passage is speaking of Jesus as a man after His resurrection. He is not a “spirit creature” as the Watchtower teaches, He is a man. Acts 17:31- Because He has fixed a day in which He will judge the world in righteousness through a Man whom He has appointed, having furnished proof to all men by raising Him from the dead. This is speaking of a future event in which all mankind will be judged by a man. The context of the passage reveals that this resurrected man is none other than Jesus Christ. Again, we will not be judged by a spirit creature, we will be judged by a man. We talked about a few other topics as well, and I wrote down more passages for them, but it was about time for me to meet my brother. The ladies wanted my contact information so they could answer some of my questions. I gave them one of my non ministry e-mail addresses and they promised to get back with me. I was happy to be able to have a chance to witness to these ladies, and I did learn something in the process. I need to put a Bible on my PDA. If I would have had my Bible with me, the points I made would have had much more of an impact. I’ve got a Treo 600 and lots of space on it. I need to load it up with some witnessing materials so that I will be better prepared in the future. Please join me in prayer for these two JW ladies. May God reach them, take them from darkness and bring them into His marvelous light. I am working on a paper for my Theology class and wanted to write about something that I could use for our ministry. I decided to write about the history and significance of the Divine name and then tweak it when I am done in order to use it for our work with Jehovah’s Witnesses. I am also speaking about this subject this coming Sunday at Shavano Baptist church in San Antonio, TX and then again at the Witnesses Now for Jesus Convention in Pennsylvania. For more information, check out the calendar on our ministry web site. to imitate the original pronunciation… And the same is true with the name Jehovah. Parts of this publication are included on the Watchtower’s website. You can read the above quote here. After reading the above quotes, I got to wondering what Jehovah’s Witnesses are called in Israel. If we are to follow the advice to use pronunciations that are common to our own language, and the only pronunciation of the name of God is Yahweh, then shouldn’t Jehovah’s Witnesses in Israel be called Yahweh’s Witnesses? I could only think of one way to find out. I called the Writing/Correspondence department of the Watchtower Bible and Tract Society to find out. I spoke with a man (who refused to give me his name) and asked him the question. As I figured, it was something he had never thought of and was curious about the answer as well. He had no idea how to figure out the answer so I asked him to check for Hebrew speaking congregations in the New York City area. He checked a number of his sources and kept coming to a dead end. There was nothing listed for Hebrew, Israeli, Jewish, Yiddish or any other name we could think of. I couldn’t help but point out to him the irony that there are no Hebrew speaking congregations of Jehovah’s Witnesses in an area that is filled with Jews. He said he knew that the names of all Witnesses world wide were based on the English pronunciation of Jehovah, but could not find the pronunciation for the Hebrew language. There was nothing he could do to help me. His last suggestion was to call the branch office in Israel and see if I could find someone who spoke English. I did just that. I spoke with someone who sounded like an Englishman and asked my question. He told me that when they go door to door, they introduce themselves as Yehovah’s Edei, or Jehovah’s Witnesses. I asked him if they have trouble using that pronunciation and he admitted that they did. He said that Yehovah (Jehovah in the English) is not a recognized usage of God’s name and that they have never heard it. He added that if people have heard the name, it is because they have heard of Jehovah’s Witnesses and not because it is used as God’s Name. In order to be fair I asked if Jewish householders would recognize the Hebrew pronunciation of Yahweh and he said that they would not. The Jews have been told too many times that God’s name is too holy to pronounce so they would not recognize any pronunciation for God’s name. It occurred to me after I got off the phone, don’t Jehovah’s Witnesses take pride in the idea that they are the “only ones” using God’s name and teaching people of all languages and cultures that God expects us to use His name? According to the DIVINE NAME brochure shouldn’t people use the pronunciation of God’s name in their own language? If this is all true, then why are Jehovah’s Witnesses using the English pronunciation of a Hebrew word in a Hebrew speaking country? Why aren’t they making God’s name known to the very people whom God chose for Himself and why aren’t they using the pronunciation that would be appropriate for Israel? It certainly does not seem consistent.